I’ve had some good peanut brittle in my time with Candy Addict, but I’ve never seen these nifty flavor twists: Coco Nutty and Yippee Cayenne. I wonder how they’ll work with the brittle. 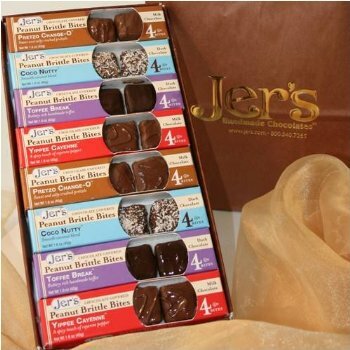 Jer’s Handmade Chocolates is a relatively new company in San Diego. I was not happy with their Toffee Break Gourmet Dark Chocolate Peanut Butter Bars, but I’m still ready to like these Brittle Bites – especially given the quality ingredients. Let’s try the Coco Nutty bites first. These come in a small 1.6 oz box, with four individual, small bite-sized pieces. I pop one in my mouth. The coconut flavor hits first, and strongly. Then the crispy brittle, which is hard to discern because of the strong coconut flakes. 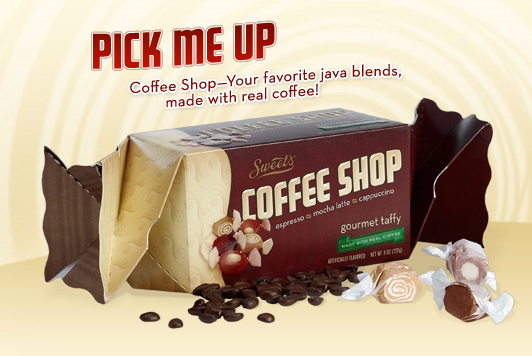 Lastly I notice the dark chocolate, quite far in the flavor background. I can see how some people would like these, but to me the coconut flavor’s too strong, masking the brittle and chocolate elements. Oh, and these are peanut brittle, but I couldn’t even taste the peanuts. Let’s try the Yippee Cayenne. Another guest review from our friend Laura Kaspick. Like fellow Candy Addicts Caitlin, Robbie, and Laurie, I recently had the pleasure of attending the All Candy Expo. 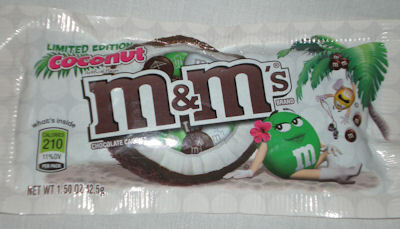 One of the products I was most excited to get my hands on was the Limited Edition Coconut M&M’s. As soon as the show floor opened, I eagerly made my way to the Mars booth to get myself a sample. Imagine my disappointment when I was told they wouldnâ€™t be available at the Expo! Although I did recover (itâ€™s pretty tough to be in a bad mood when surrounded by free candy), I was still thinking about my loss when I attended a Mars press conference later that day. Midway through the presentation, Mars president Todd Lachman turned his focus to upcoming product releases, including the Coconut M&M’s. I half tuned him out as I wasnâ€™t interested in hearing about Coconut M&M’s, I was interested in eating Coconut M&M’s! But I quickly snapped to attention when I heard â€œ…and actually, here in my pocket, I happen to have a sample…â€ and then which lucky member of the audience do you think he threw them to??? ME!!!! I couldnâ€™t believe my good fortune, and now I am going to share my good fortune with you by telling you what you have to look forward to when they come out this summer.